1. Can Australia make a difference by taking action? While it is true that Australian emissions are small on a global scale and that therefore even reducing them to zero wouldn’t be sufficient to affect levels of CO2 in the atmosphere, this isn’t a reason not to take action. Climate change is a collective issue, a tragedy of the commons, which requires collective action to solve. No one country, region or industrial sector can solve this unilaterally. 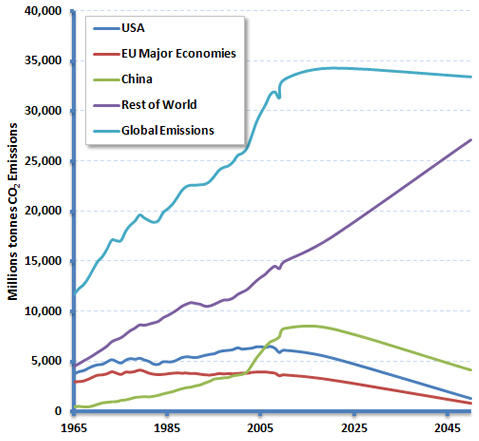 Even if the big three, China, the USA and the major EU economies acted alone (with China reaching a plateau in the short term and then reducing by 50% by 2050 and the US and EU reducing by 80% by 2050), global emissions would plateau at best assuming that the rest of the world emissions grew by no more than 1.5% per annum over the next 40 years (in fact they have been growing at well over 2% p.a. over recent decades). So this issue needs a response from all nations, including Australia. Will Australia inspire other nations? This isn’t the primary motivation of acting and in any case many nations around the world are beginning to move on this issue and take action. The responses still vary widely, but they are underway. For example, Canada is developing legislation to stop the further construction of coal fired power stations, unless carbon capture and storage is utilised. China is now very close to introducing a carbon price into some parts of its economy and California is starting up a cap-and-trade system. The list is long and growing, even though the sum total of global efforts fall short of the necessary level of ambition. 2. What about agricultural emissions? There is no doubt that agricultural emissions are important. As such, they featured in some detail in a recent study released by WWF and Ecofys which looks at the feasibility of a near zero emissions world by 2050. Although the primary focus of the report is energy, there is much said about agriculture because of the growing interaction with the energy system. For example, see page 62 of the report for a series of recommendations that relate to food and agriculture. 3. Isn’t it true that the magnitude of future warming is not “settled science”, but in fact highly uncertain? Climate change is all about uncertainty, but a great deal of work has been done in this field. The MIT Joint Program on the Science and Policy of Global Change focuses considerable effort on communicating the risk and uncertainty (The Greenhouse Gamble) related to climate change. But importantly it also demonstrates that a policy led approach to managing emissions can shift the risk and offer benefits over the long term. 4. Shouldn’t we just go nuclear? At least for the time being, there is no single solution to this issue. We will need a broad range of solutions. Even in France where nuclear has grown to dominate (~80%) the electricity sector over the last 40 years, emissions have only fallen by 14% (from 435 MT to 374 MT from 1971 to 2008 according to the IEA). 5. Are climate skeptics funded by industrial concerns so as to maintain the status quo? The origins of climate skepticism and the driving force behind it is examined in great detail by Naomi Oreskes and Erik Conway in their book “Merchants of Doubt”. This is an excellent read and turns up some surprising answers, linking those who question and challenge the issue of climate change with the same people and groups who challenged tobacco as a cause of cancer, acid rain and the destruction of forests, chlorofluorocarbons and the thinning of the ozone layer and so on. 6. Why is there so little investigative journalism into the science and its flaws. This is because the science isn’t flawed. Yes, there remains uncertainty, but new research is refining and improving our knowledge of the Earth’s climate system and how it is expected to respond to increasing levels of CO2. I discussed the science in some detail in a recent post. 7. Renewables are viable now, so why do we need coal and uranium for baseload power? A number of renewable technologies offer a great deal of potential and some are being widely deployed, such as onshore wind. But there are limits to the rate at which these new technologies can be fully developed and deployed. As such, we will need a broad range of energy technologies for a long time to come. My colleagues in the Shell scenarios team wrote about these limits in an article published in Nature late in 2009 and I discussed it in a posting at that time. 8. Is it possible to have a fruitful debate on the science given existing belief structures? As mentioned above, I discussed the science at some length in a recent posting. But we do seem to live in a world today that is becoming detached from science, despite our increasing dependency and love of technology. I wrote a post on this last year. Perhaps belief structures are getting in the way, an issue which is also discussed by Naomi Oreskes in the book mentioned above. 9. How do the Liberal Party’s policies compare with other centre-right policies around the world? I don’t think there is such a strong link between political leaning and climate policy, despite the rhetoric on this subject. Policy approaches vary widely around the world as do the governments that set them. For example, in the EU where there are 27 Member States with governments covering a broad range of the political spectrum, including many centre-right governments, there is a comprehensive climate change policy framework now in place which includes emissions trading, long term targets and tough energy efficiency goals. This policy framework goes beyond any of the party proposals under consideration in Australia today, but equally it has been in development for nearly ten years. It started out very modestly. In North America where there has been little progress on climate legislation at the federal level, many US States and Canadian Provinces, again covering a broad range of the political spectrum, have implemented far reaching emissions management policies. In the United States it was the Republican Party (centre-right) which introduced cap-and-trade (emissions trading) to the world when they decided to use that policy instrument to manage sulphur emissions from power stations in the 1980s. 10. Why should we believe the science when there is no observed relationship between climate and atmospheric CO2? There is really no question of a relationship between climate and atmospheric CO2. 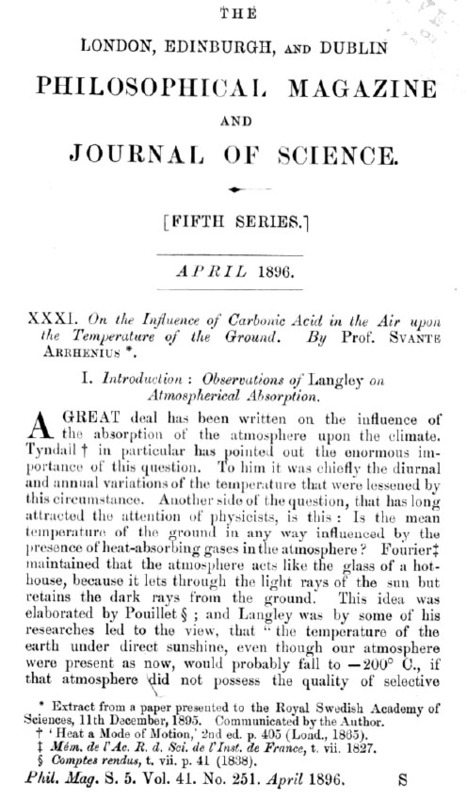 This was shown over 100 years ago and explains very clearly and without challenge why the surface of the planet is temperate where a simple heat / radiation balance calculation shows that it should be frozen. The issue is therefore how much more change will occur as we double or triple the level of CO2 in the atmosphere. I do not agree with many of your statements. However, to keep the discussion focused I will choose only the last paragraph of you post which refer to the issues critical to access impact of CO2 on the climate. The key argument IPCC is using is the so called “hockey stick” invented by M. Mann and popularized in IPCC (by Jones and Mann), and eventually by Al Gore. I’m wondering how much do you know about the scientific controversy of this chart. As a scientific advisor you should be fairly familiar with this chart so I would like to put your knowledge to the test by asking simple questions. –	Was a standard statistical method used to derive hockey stick chart? –	Are there any issues with temperature proxies used in this chart? Is there any proxy used in the hockey stick deemed as very poor? –	Is there any clear basis why to choose proxies selected? –	Were any proxies edited to get better agreement with CO2 concentration? My questions require just simple answer yes/no. Obviously, I’m ready to answer any of your questions.